Karen Mulder was born in Vlaardingen, Netherlands on June 1, 1970, is a Dutch model. She was discovered at age of 17, after a friend of her secretly sent her pictures to modelling contest "Elite Look of the Year" in Amsterdam (1985). She is one of the top supermodels of the 90's. She walked in the Victoria's Secret Fashion Show from 1996 to 2000. Became a Guess girl in 1991, at age of 21. Appeared in the 1997 and 1998 Sports Illustrated Swimsuit editions. Her hobbies are singing, painting, reading and watching movies. Her favorite film is Roman Holiday (1953) with Gregory Peck and Audrey Hepburn. 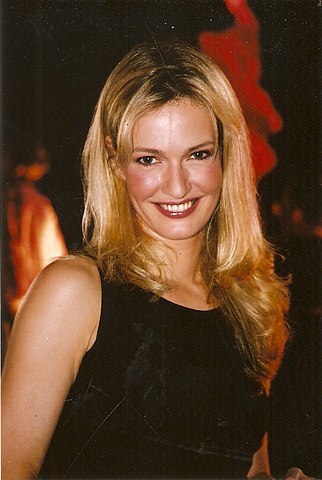 She dated Jean-Yves Le Fur (1993-1995). She was married to French photographer Rene Bosne (1988-1993). Yves Saint Laurent, Guess, Giorgio Armani, Calvin Klein, Ralph Lauren, Gianni Versace, Chanel, Saks Fifth Avenue, Swarovski, Synergie, Tabak. Emporio Armani, Giorgio Armani, Chanel, Alberta Ferretti, Alma, Chloé, Dolce & Gabbana, Fendi, Genny, Gianni Versace, Luciano Soprani, Martine Sitbon, Salvatore Ferragamo, Gianfranco Ferré, Thierry Mugler, Valentino. Represented by agencies Marilyn Agency Paris. Music is what turns me on! From the beginning, I hated being photographed. For me, it was just an assumed role, and in the end, I didn't know who I really was as a person. Everybody was saying to me, 'Hi, you're fantastic.' But inside, I felt worse from day to day. My job distracted me from my worries. It enabled me not to be myself, to pretend I was someone else. But when my energy was no longer directed towards this one goal to meet the anguish caught up with me.